It’s funny because my dad, a HS coach, told me that I should be an Athletic Trainer long before I entered high school and before I knew what an Athletic Trainer was. Once I was in high school, a shoulder injury sent me to the Athletic Trainers, Matt Gross and Dottie Fero. Going in for treatments every day, Fero asked me if I wanted to become an SAT. After I had been an SAT for a while, I went to an NBA playoff game between the Dallas Mavericks and Sacramento Kings where I saw a female “AT” on staff. From that moment, I knew I wanted to be that person helping the athletes. I asked Fero “how can I do that” and she taught me everything and anything I wanted to learn. I finally understood what my dad meant that this profession was the perfect fit for me. 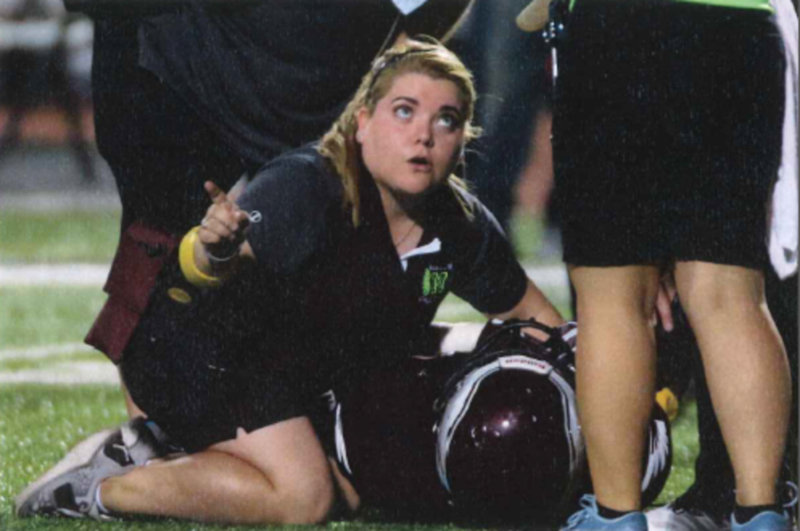 All of my high school Athletic Trainers (Dottie Fero, Matt Gross, Patrick Solis and Joe Resendez) had a hand in guiding me towards the profession and helping me find my passion. I got into Athletic Training because it was a chance to help an athlete return to competition after injury. However, I’ve gained much more than the simple enjoyment of helping someone. From the people I’ve met while working to some amazing places I’ve traveled and then to the bonds I’ve forged with athletes, parents, and coaches; I am grateful for this profession. I’ve been fortunate to have amazing mentors I’ve been blessed to learn from, exceptional partners at work, and amazing student athletic trainers to teach. I am excited for what comes next. I’ve been lucky to have been able to travel with USYSA boys soccer on some amazing trips. I traveled to Alabama and Florida for regional events. Last spring break, I went on my first international trip to Lisbon, Portugal for a training/competition against Portugal’s premiere league teams. I actually have the opportunity again to travel internationally, this time to Scotland and Ireland in a couple weeks. I love going to these soccer camps because even though it is still work, it allows me to be somewhere different for a little while and I get to see athletes of varied ages doing what they love. Once, a few years back, I went to Omaha, Nebraska for the College World Series as part of a continuing education course. It was a bucket list item where I mixed Athletic Training and cheering on my Longhorns in the CWS! Athletic Training is a very rewarding career. It can also be draining at times. Take care of yourself and your family. When I was on my own for a short time, I put so much pressure on myself to make sure I was everywhere and everything was done. I started to get burnt out and this was one of the hardest lessons I had to learn. Do not overwhelm yourself trying to take care of every, single little thing. Do what you can at that moment, and learn that sometimes you can’t do much. Tomorrow is another day where you can approach the issue at hand with a clearer mindset. Also, take every opportunity that you think is worth it to do what you need to. Whether it be more work, more travel, more alone time, take it. Whatever you need to be the best you can be, make sure you do it.